Pirelli's flagship winter tyre model, the Winter 270 SottoZero Series 2 is designed for the most demanding drivers to be used in some of the most demanding conditions. Pirelli also claim that the SottoZero series 2 will also guarantee to offer excellent perfomance on dry roads, making it the ideal choice for U.K roads where the weather can be very tempermental. 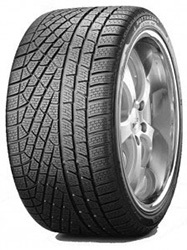 With a tread pattern desgined to disperse water as fast as possible, in temperatures below 7 degrees the Pirelli Winter SottoZero series 2 will really come in to it's own. With incredible scores from the EU tyre labelling tests the SottoZero is a truely natural choice for those looking for a perfomance winter tyre which doesn't comprimise on safety. Superb stability and lower noise emissions all add to a more comfortable ride on the Winter 270 SottoZero 2.